I made this creamy avocado sauce specifically to accompany some chorizo & cheese filled empanadas. I wanted the flavors of guacamole but wanted something easier to pair with empanadas than the typical chunkier guacamole. 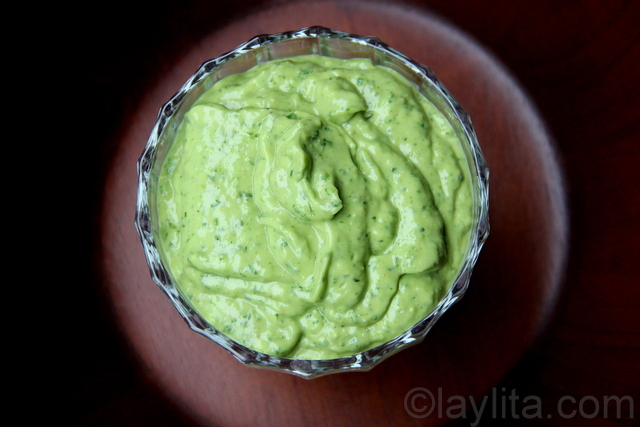 This avocado sauce is perfectly smooth, refreshing and spicy. It turned out to be a great sauce not just for empanadas but also for grilled meats or seafood, a replacement for mayonnaise on sandwiches, or simply a great dipping sauce. 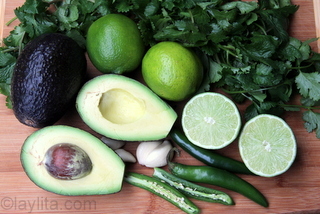 This avocado salsa is very easy to make: just put all the ingredients in the blender. Of course, it helps to chop and crush the ingredients a little before; this will minimize the number of the times you have to shake up the blender before pulsing again (and again). 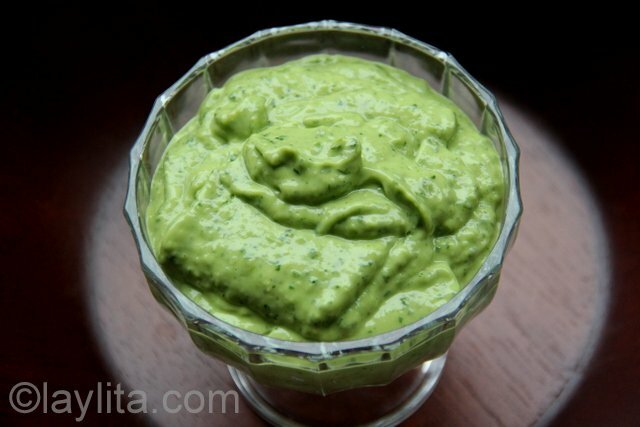 Creamy avocado sauce recipe made with avocados, limes, cilantro, hot peppers, garlic, olive oil and cumin. 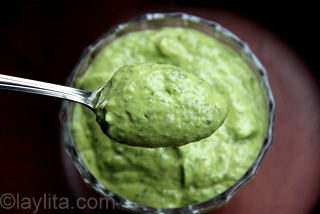 This is great dipping sauce for empanadas and can also be used for grilled meat and seafood. 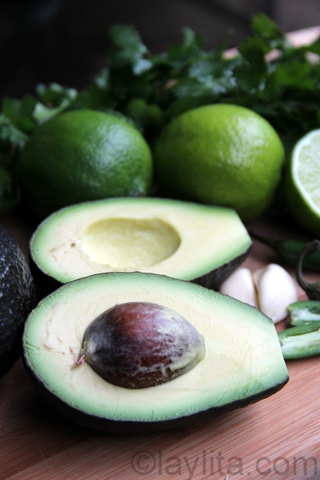 Combine all the ingredients in a blender; it helps the blending process if the avocados are in small chunks and the cilantro is lightly chopped. I also recommend crushing the garlic before putting it in the blender to ensure no one gets a surprise large piece of garlic. Blend until you have a smooth sauce. Use immediately or refrigerate until ready to use. You can adjust the heat level based on your preference. My family -kids included- has a decent tolerance for spice; however, you can also make this sauce very mild by using jalapeños – removing the veins and seeds help reduce the spiciness. 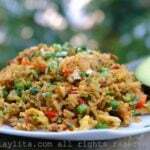 For a spicier version use Serrano peppers or Habaneros. 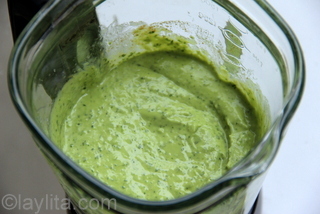 This sauce can be made right before serving or ahead of time, it has a lot of lime juice which prevents it from oxidizing, so it can last up to 24 hours before turning brown. I made this for Super Bowl. I used this to top marinated chicken tacos al carbon It tasted awesome. 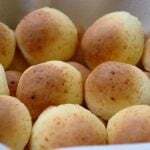 Gracias Laylita por la receta. Your recipes look amazing, can’t wait to try them. I’ve made this sauce a couple of times now; it was fantastic. I used it as a dip with Beanitos chips as I needed a snack while on an elimination cleanse from milk products. The sauce is so creamy and delicious I didn’t miss sour cream, etc at all. It makes a large batch therefore I usually freeze half of it in a ziplock bag. It freezes beautifully! I made this yesterday and it was delicious!! A perfect variation of guacamole and very simple to make by dumping everything in a food processor!! 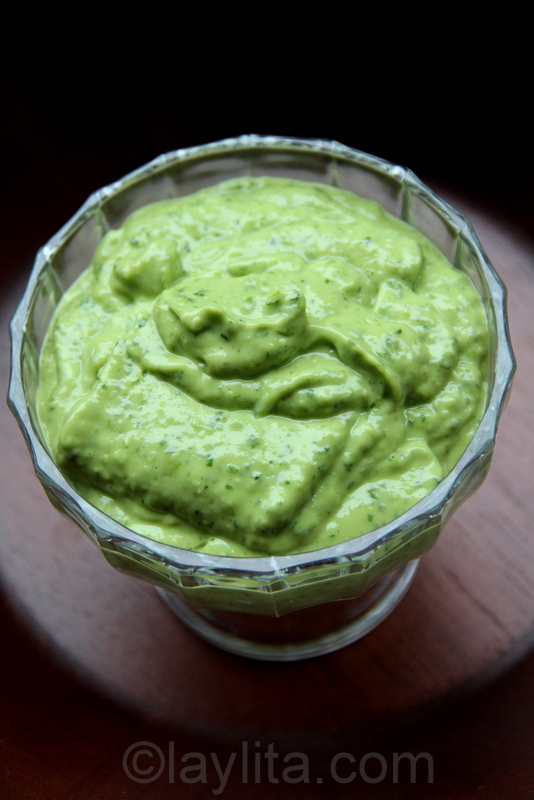 Yum yum yummy :) delicious avocado sauce recipe that is simple yet with exotic flavors. I love this!! Going to make again today! Made this to have with Pollo Asado. Absolutely delicious Y u m !!!!!! Try this on salmon; grilled, baked or pan fried. It’s delicious!!! I tried this for the first time on Sunday to use at our cookout. It was amazing!!! This looks delicious! I always wonder what to do with avocados because eating slices gets old after a while… I need to head out to the store to buy some more avocados and try this! Simply beautiful. 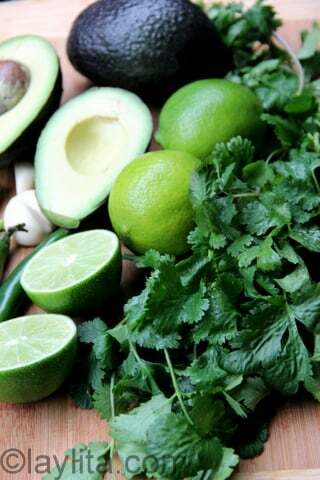 Avocado and guacamole are one of my favourite accompaniments! I mean who doesn’t like a bit of amazing sauce to go with their food. I enjoy the fact that everyone makes their sauces to their experience and taste and how that differs in flavour. Definitely trying this one! Thank you. I must try this. No sweat!